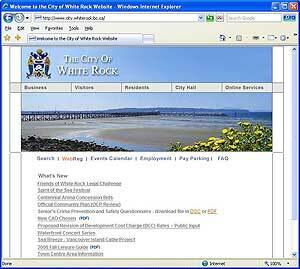 The City of White Rock is a unique, vibrant, oceanside community of 20.000 residents known for its sunny weather, expansive beach, historic pier, delightful restaurants, and sense of community. Located half an hour south of Vancouver on the shore of Semiahmoo Bay, White Rock continues to maintain a character that distinguishes it from surrounding cities. The City of White Rock employs approximately 100 regular full-time staff, with additional casual, auxiliary, temporary, and seasonal positions whose numbers fluctuate throughout the year.